Posted on Saturday, February 20th, 2010 at 11:53 am. 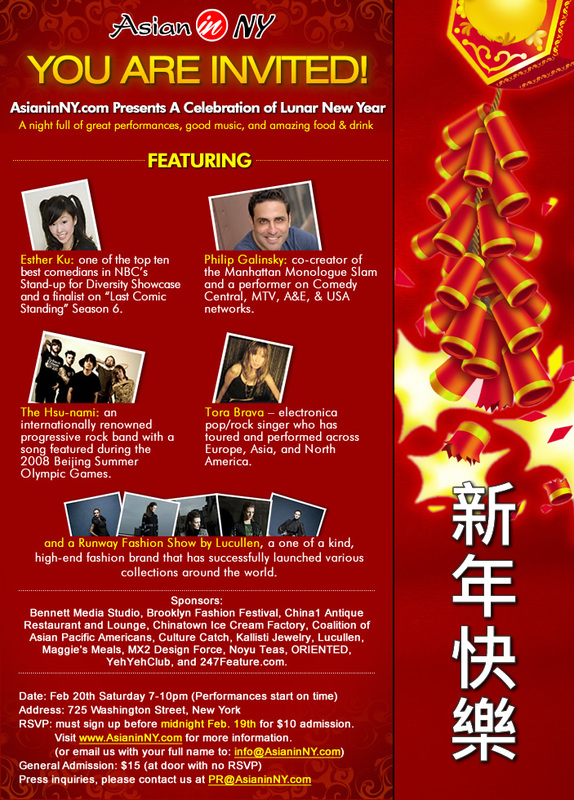 AsianinNY.com is proud to host a festive celebration of the Lunar New Year on Feb 20th with a night full of great performances, good music, and amazing food and drinks! This is going to be a night to remember for the start of the Lunar New Year – the year of the Tiger! Esther Ku: one of the top ten best comedians in NBC’s Stand-up for Diversity Showcase and a finalist on “Last Comic Standing” Season 6. Philip Galinsky: co-creator of the Manhattan Monologue Slam and a performer on Comedy Central, MTV, A&E, & USA networks. The Hsu-nami: an internationally renowned progressive rock band with a song featured during the 2008 Beijing Summer Olympic Games. *fronted by Taiwanese American erhu rock star Jack Hsu! Tora Brava: electronica pop/rock singer who has toured and performed across Europe, Asia, and North America. and a Runway Fashion Show by Lucullen: a one of a kind, high-end fashion brand that has successfully launched various collections around the world. Bennett Media Studio, Brooklyn Fashion Festival, China1 Antique Restaurant and Lounge, Chinatown Ice Cream Factory, Coalition of Asian Pacific Americans, Culture Catch, Kallisti Jewerly, Lucullen, Maggie’s Meals, MX2 Design Force, Noyu Teas, ORIENTED, YehYehClub, and 247Feature.com. For more information, check out http://www.asianinny.com/?page_id=6262.